The Nexys Video Has Launched! As you may have surmised from Jesse’s post earlier, we have a new product, the fantastic Nexys Video! To learn more, I talked to Sam Bobrowicz, one of the people at Digilent who worked very hard to get this product released. Why is the Nexys Video so amazing? Well, if you love audio and visual applications — and who doesn’t? — then this is perfect. 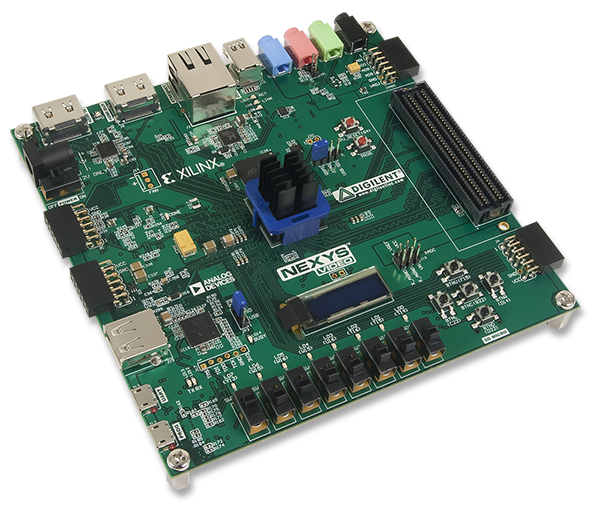 The Nexys Video is a descendant of both the Atlys board and the Nexys line, but the Nexys Video has updated peripherals and a new Xilinx 7-series FPGA. This allows the use of Vivado (though it is still compatible with ISE). Additionally, it includes a display port output, which makes for higher resolution videos. Sam showing the Atlys board and the Nexys Video. 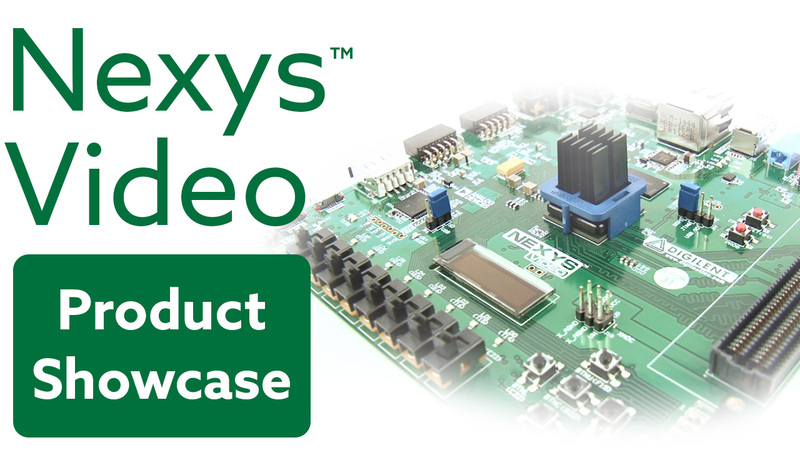 The Nexys Video is perfect for AV applications and video processing pipelines. It’s also ideal for more complex research projects (it does require more programming experience than the Nexys 4 DDR). It’s definitely a great MicroBlaze softcore target. Besides, MicroBlaze in Vivado is free to use for students! Some other applications that would work well are tracking and real-time facial identification. 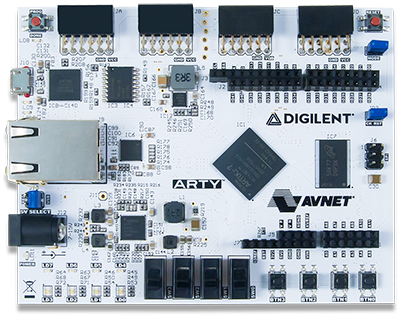 The board had its challenges getting to wear it is today — it originally had a Spartan core, and then it became clear the board would be more powerful with the Artix-7 FPGA. In the first run of the board, there wasn’t a hole in the board to allow the addition of the OLED. Additionally, a heat sink had to be added in order to prevent overheating. Obviously, all of these concerns were addressed and the board is now ready for use! The Nexys Video is available for purchase from $499 (and $299 for students!) on the Digilent site. 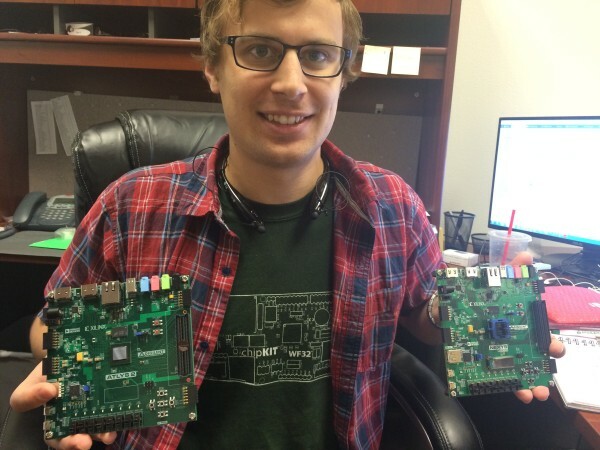 Let us know what kind of applications you end up finding for this board!